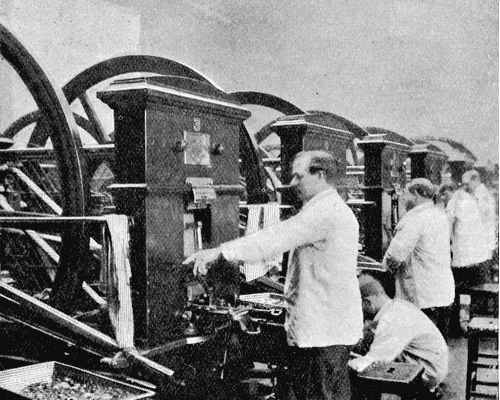 The Royal Mint—Gold and silver bars—The melting-houses—The rolling-room—Cutting the blanks—Marking—Annealing—The coining-presses—Weighing the coins—A very delicate automatic machine—Counting by machinery—Medals—Making a die—A popular fallacy. [p.13] THINGS are manufactured to be bought and sold. Buying and selling imply, in most cases, the transference of coin from one person’s pocket to that of another. So, after thinking over for some time the question of priority of subject, I have decided to open this book with a chapter on the making of the “coin of the realm,” as conducted at the Royal Mint, a large building situated a few hundred yards to the north-east of the famous Tower of London, which itself was the seat of coinage until the erection of the present Mint in the year 1811. [p.14] The Royal Mint is not at all imposing as seen from the street—just a long block of offices on the farther side of an open courtyard. One would never suspect that from some workshops at the rear of this block proceed most of the gold and silver coins issued in the British Empire, and all the medals issued to the navy, army, and royal societies. It is a unique factory, as far as the empire is concerned, since it has the sole right of manufacturing a certain class of article. Clever gentlemen who set up rival factories in secret places, and happen to be caught at work, are lodged for a long period at the country’s expense, under conditions in which money is of very little use to them. Behind the office block is a quadrangle surrounded by low buildings. 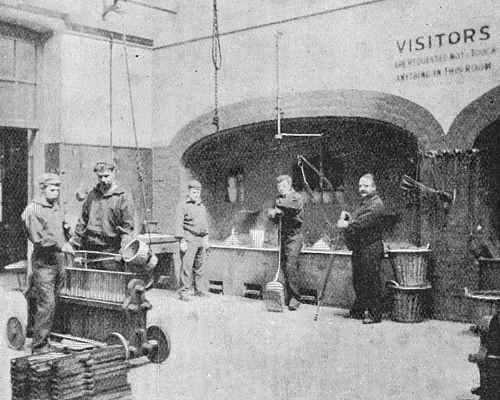 Entering a door on the left, the visitor finds himself in a room where ingots of gold, silver, and copper are weighed very carefully before being handed over to the workmen. Great exactness is characteristic of all business at the Mint. A certain weight of metal is given out, and it must return to the office in the shape of a certain number of coins. If a single coin be missing, it is hunted for till found. Even the dust in the workrooms is collected and put in the melting-pot to recover all the minute particles of metal it contains. And, as [p.15] we shall see, exactitude within very narrow limits in the dimensions and weight of the coins themselves is enforced. 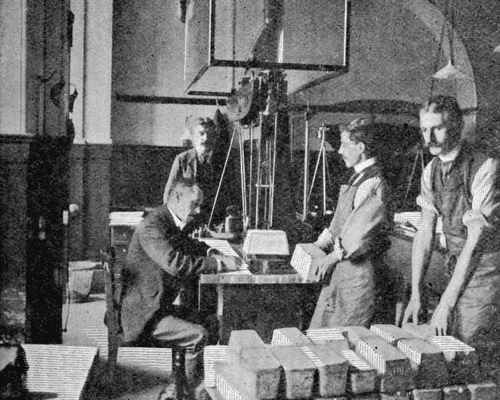 Gold comes to the Mint as ingots of 400 oz. ; silver in 100-lb. blocks. 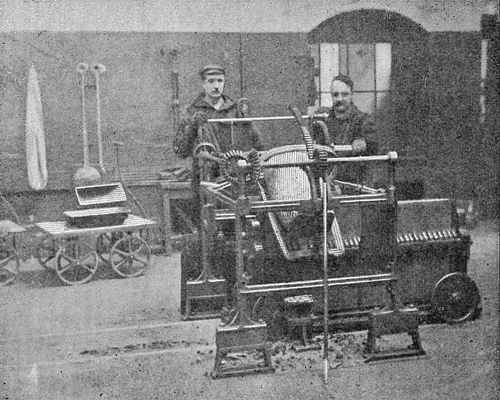 All gold coins are made of an alloy containing 22 parts of gold to 2 of copper ; silver coins of an alloy of 37 parts of silver to 3 of copper; and for bronze coins a mixture of copper, tin, and zinc is used, bronze discs for the same being [p.16] occasionally manufactured in Birmingham. On rare occasions bronze has been coined by outside firms. Specimens can be recognized by the letter “H” which appears on the reverse below the date. But as it is the stamping that converts metal into coin, the Mint may be considered responsible for all three coinages. On either side of the office is a melting-room—one for silver, the other for gold. In the first a couple of men are extracting, by means of an electric crane, a large plumbago (blacklead) melting-pot from a hole [p.17] in the top of a furnace. It contains about 310 lbs. of molten silver. The crane brings the pot over a rack of moulds, which consists of a number of iron bars of H section clipped together by a screw-press, so that their edges make a tight joint. The pot is tipped up, and the moulds are filled in succession; and after a few minutes the fiery liquid has cooled into solid shining bars, which are easily separated from the moulds when the screw has been released. The coining-press room is by far the noisiest place in the Mint. One cannot wonder at this, considering [p.21] that twenty presses are each stamping the King’s portrait on ninety blanks a minute, and that each blank receives a 30-ton blow. 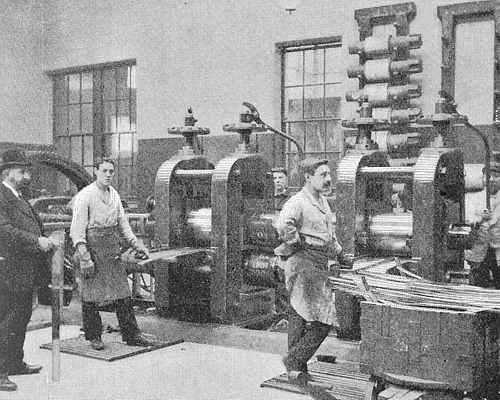 There are two dies in each machine, one fixed in the bed, the other in a socket at the end of a lever immediately above. Between the two dies is another lever carrying a collar, the inside of which is serrated, or “milled,” in the case of gold coins and all silver coins except the crown and threepenny-bit. An [p.22] automatic arm pushes a blank on to the lower die. The collar descends, encircling it. Then down comes the upper die with tremendous force, squeezing the surfaces of the blank into its own design and that of the lower die, and forcing the edge sideways into the fluting of the collar. The next moment it rises, followed by the collar, leaving the (now) coin to be pushed down a shoot by the succeeding blank. In one day a machine can coin about 40,000 blanks. The coins are now finished, but before being issued to the public they must undergo two tests— (1) for weight, (2) for soundness. Weighing is done in one of a number of very delicate automatic balances, enclosed in glass cases, which are the most interesting machines in the Mint. We must digress here a little to say that the standard weight of a sovereign is 123.27447 grains, and that no sovereign is put into circulation which is .17 grain heavier or lighter than this standard. Fig. 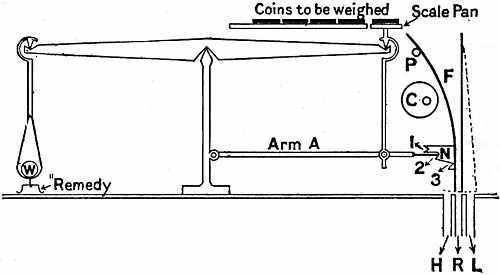 9.— Diagram showing the principle of the automatic Coin-weighing Machines. The weighing-machines are rather complicated, and in order to give the reader an idea of the principle on which they work, a very simple diagram (Fig. 9) is appended. From one end of the balance-beam [p.23] hangs a stirrup containing a counterpoise W of the standard weight. At the other end is a scale-pan, on to which the coins are pushed in succession. This pan is connected by a rod to arm A, sharply pointed at the free extremity. Close to the pan is a funnel F, which swings on pivot P, and has on the inner side a projection N, with three notched steps in it. An eccentric cam C, revolved by an electric motor, pushes the funnel outwards at every revolution. The second test is made by a boy, who picks up by the handful the coins which have passed the weighing test, and drops them smartly one after another on a steel slab. A cracked coin “rings” badly, and is placed on one side to be melted down. Finally, the coins are “overlooked” on a contrivance by means of which both sides are exposed to view successively. The sovereigns that pass the test are put up in [p.25] bags of one thousand, and returned to the office from which they came as ingots. The counting of silver and bronze coins is done by a very ingenious automatic machine. 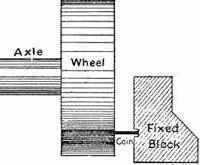 The coins slide down a shoot which is partly blocked by the teeth of a wheel geared to the counting index. In order to get past, a coin must move a tooth on; the action being very similar to a cycle chain running over a chain-wheel, coins representing the chain rollers. [p.26] It has been calculated that a sovereign while in circulation loses 29/1000 of a grain per annum, and a half-sovereign, which has much more handling, 42/1000 of a grain. When three whole grains of gold have been worn off, a sovereign is “garbled”—that is, retained and sent back to the Mint—by the Bank of England. Two rooms of the Mint are devoted to medals. The designs on these stand out much more boldly than those on coins, and the method of stamping just described would not be practicable for them. Every medal receives three blows from a large screw-press, and between two blows has to be annealed, cleaned, and polished. Its manufacture is therefore a comparatively slow business, though fast as compared with the making of a Great Seal of England, which requires two hundred blows. The manner in which a die is prepared, for coin or medal work, is interesting. The artist first executes a large model, a foot or more in diameter, in wax. From this a mould is made, and from the mould a plaster cast. On this the medallist perfects his design. A steel cast is made from this, and from that a smaller cast of the size of the coin or medal is [p.27] copied by means of a machine. This final mould is called the “matrix.” From it a “positive” die (one with the design standing out in relief as in the coin) is obtained by enormous pressure in a hydraulic press, and this in turn is similarly used to obtain the sunk dies for the coining-presses. A sunk die is not replaced until it is considered unfit for further use. A very good return for one die is 100,000 pieces. The footnote, moved to the bottom of the web page, was originally at the bottom of page 24. 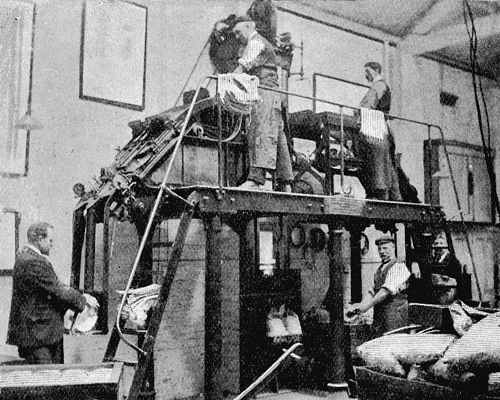 Text and original images from Archibald Williams, How It Is Made: describing in simple language how various Machines and many Articles in common use are manufactured from the Raw Materials (1907), 13-28.